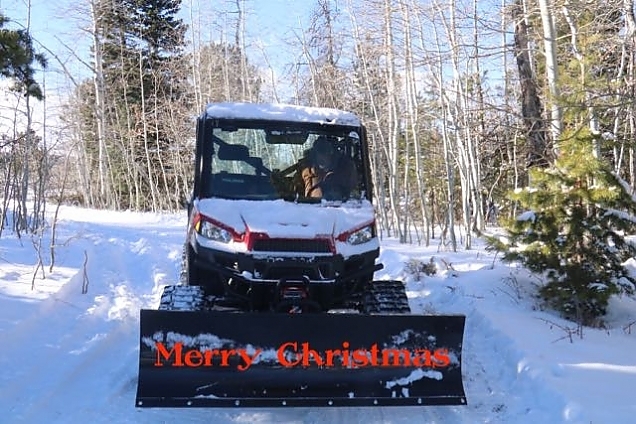 Our Christmas gift to each other was a snow plow for the Polaris Ranger. We have a snow blower, and it will come in handy for deep snows and cleaning up after a big snow. 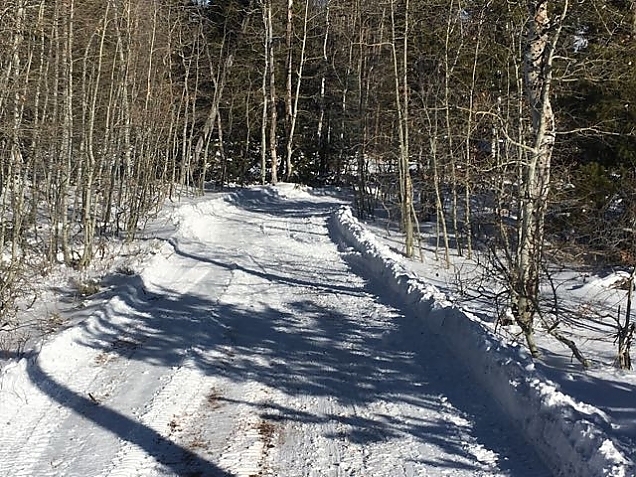 But, having a plow makes quick work of the driveway, drifts at the exit of our property, the parking area at the cabin, and maybe even for the main road to the point it meets with our neighbors. It is especially helpful when we have only a few inches of snow--too much to just ignore but too little to warrant the work of the snow blower. 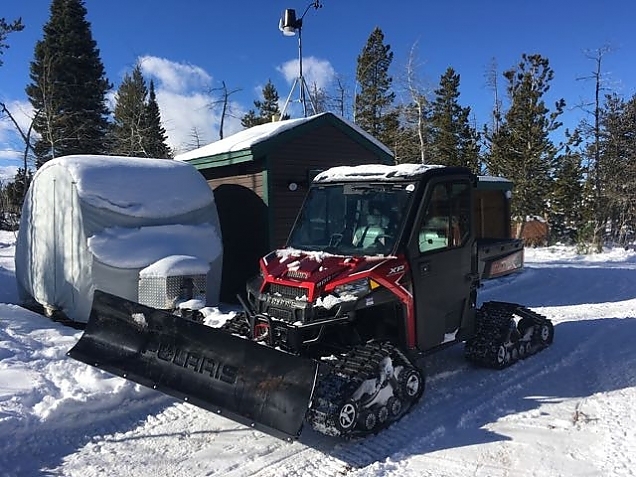 So, we called the Polaris dealer in Laramie and ordered what we needed. There were four items: a mount to go on the Ranger, the plow frame, a track extension to the plow frame, and the blade. We picked these up on Thursday, expecting a big snow on Saturday afternoon. Installation was supposed to take a couple of hours on Friday. I put a portable propane heater in the shop side of the barn and warmed it up some. The plow frame and extension could be assembled in the warm, dry shop. I then attached these to the blade outdoors, and had the job mostly done. Only the mount for the Ranger was left, and this was advertised as a 45 minute job. To mount the mount, I had to work outdoors where it was pretty cold. I put a large piece of 2" thick foam board on the ground and laid on that to do the job. My body heat was reflected and it was actually comfortable. As is typical for me, even after reading the instructions multiple times, there are terms I don't fully understand, I don't really have all the right tools, and I get ahead of myself sometimes requiring work that has been done to be undone and redone. But, after about an hour and a half, I had the mount mounted! Now on to the big moment. I drove the Ranger up to the plow assembly and followed the mounting instructions. It just didn't work. Parts were not lining up where they were supposed to be. 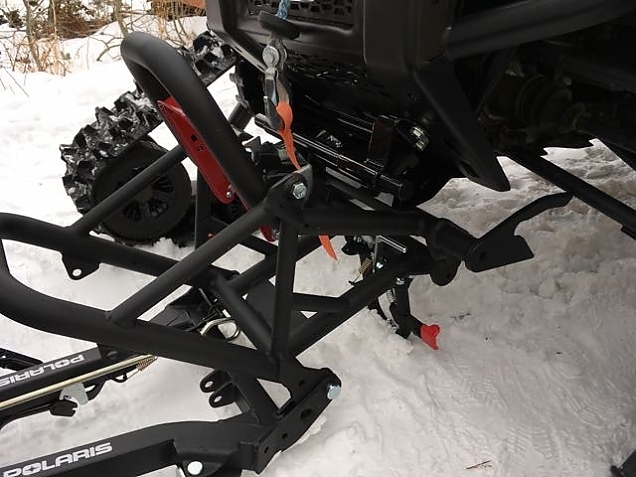 Although I saw that there was no way this plow assembly was going to mate to this mount, I kept at it for a while; scratching my head; trying this and trying that. I finally gave up. On Saturday, I brought the assembly instructions inside and started going over them all again. Suddenly, I noticed that the mount was for a Glacier II plow system and I had ordered a Glacier Pro! I called the dealer in Laramie and had to get a bit testy with them to convince them they'd given me the wrong mount. Finally, the owner got on the phone and we figured out there was a printing error in their catalog. The two mounting systems, which are very different, had the same part number. Sure enough, I had laboriously, in freezing conditions, installed a mount that would never work. Despite the threat of heavy snow in the afternoon, we drove into town and picked up the right mount. I picked up the tools I needed to make the job easier. We got home mid-afternoon. I immediately began the process of uninstalling the wrong mount and reinstalling the right mount. Turns out the right mount was very easy to install. But, the wrong mount was hard to install and deinstall. It even had some electrical splicing that I had diligently done that was not needed. Saturday was warmer than Friday, but very windy. Still, using the wood shed as shelter, I got the swap done. Now the big moment. I drove the ranger up to the plow. Inched forward. Click! I got out to see that everything lined up and clicked into place. I hooked the plow up to the winch on the Ranger and was able to raise and lower it easily. I even plowed the 2" of snow we had! Good thing this got done, too. Overnight Saturday we got 5" of snow, maybe more in a few places. 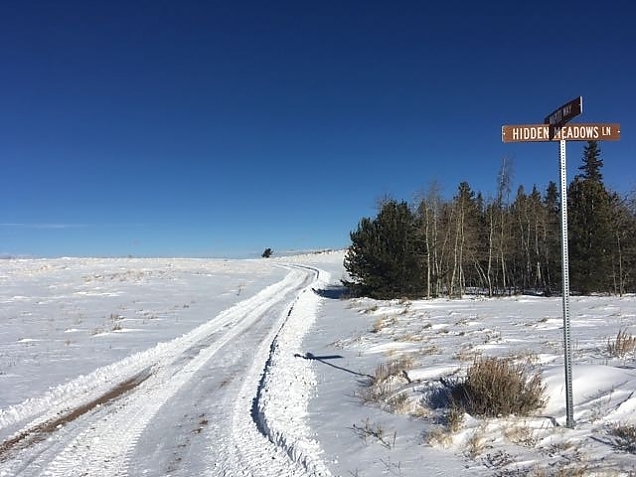 I had a great time plowing the driveway and parking area, and Hidden Meadows Ln down to Wapiti Way. One has to be careful when plowing as opposed to blowing snow. Plowing creates piles of snow that can easily become snow fences and actually make future snow management more difficult or impossible. I work hard to keep the piles on the north and east sides of the road and driveway. We can get wind from those directions, but the dominant direction is from the south, southwest and west. Sunday afternoon was pretty and sunny, although windy. At least the winds were from the "right" direction. I think Monday and Tuesday are going to be nice, too. But, then we are predicted to get snow again for the rest of the week. Our Christmas Gift Plow is likely to get a workout! Hidden Meadows Lane from the top of our driveway. 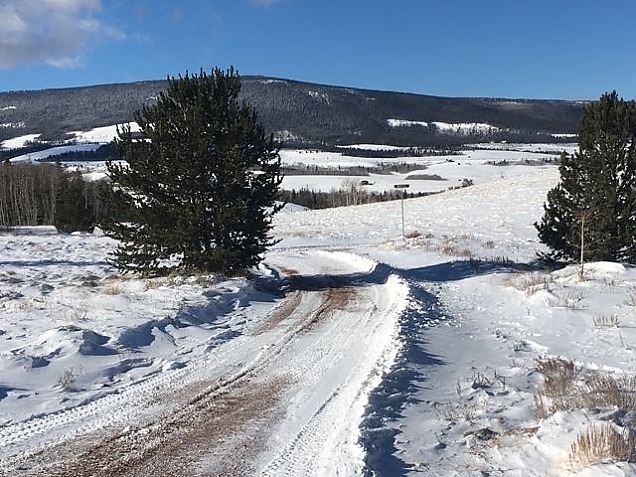 Forest Service Circle / Wapiti Way -- the way out toward town.